Our Bounce House and Party Rental Place love South Florida and all the wonders it has to offer. So we decided to feature some of what Broward County has to offer. Have you ever been to Tradewinds Park and Stables? No.. Read on! If you’ve been selected to plan your next party or corporate event, then you know how challenging it is to nail down a good location. It’s one of the biggest hurdles that you have when making sure that everyone attends and has a good time. There are many things to take note of when looking for the best location to book your party, but here are ten reasons why you want to go to Tradewinds Park and Stables you didn’t know about. 1.) 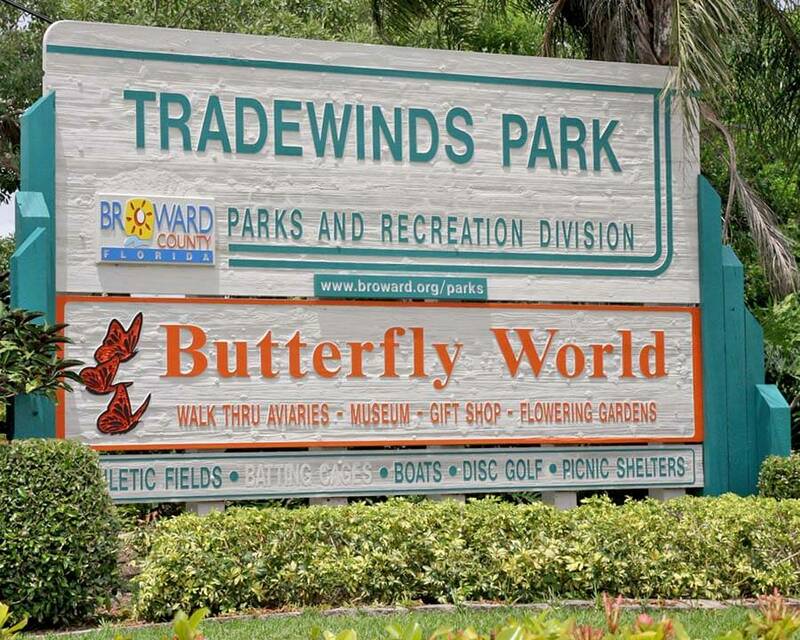 Tradewinds Park is located in Coconut Creek, West of I95 in Broward County. Its easily accessible from Palm Beach and Miami/Dade counties. Simple to find and right off the expressway. 2.) Plenty of pavilions and tents available for rent if you are booking a private party. You must call ahead of time and make reservations and if you’ll be renting a bounce house you need to let them know ahead of time so they can accommodate for space. 3.) There’s a variety of activities and it’s next to a sports field that can be used for both Little League, Adult and Private teams. Contact the park for schedules or visit them online for more details. 4.) Butterfly World is one of the most magical additions to the park. It’s located on the South side of the park and close to 2 different Rental areas that can accommodate 40 people or less. Both adults and children can discover the wonder and beauty of these incredible creatures by the delicate nature of the center. You can visit Butterfly World on its own or during your party for an additional cost. 5.) If your family enjoys horses and ponies, then this is the place for you. Tradewinds has an equestrian area equipped with both guided and private riding trails, making this a special place by far. There is a cost for throwing a birthday party at this location so contact them for reservations and info. 6.) Fishing and Boating is a must when you visit this park. Lots of catfish, bass and bluegill for the kids to have a cast and catch the experience. Whether it’s your first time fishing here or your last, it’s a delightful way to spend a day. Don’t forget to check the weather. 7.) Plenty of biking and walking trails for your family to enjoy. Nothing like taking in the fresh air while strolling on your bicycle or walking. The natural environment and plenty of wild birds will fill your heart with wonder on some of South Florida’s best kept trails. 8.) Pet Friendly Park – Give Fido a bath and head over to the dog park. If you’re booking a pet wedding or pet birthday this is the ideal location. Whether the party is for your dog or not, you know the park is “Dog Friendly”. Dogs must be kept on a leash unless you are inside the dog park gate, then it’s all barks are off! 9.) South Florida Bounce is on their Vendor Approved List. Our inflatable bounce house and party rental company in Broward County is allowed to operate in the park but must be approved by their authorities by meeting certain criteria. We passed yeaaaa! This is the list of reasons you should visit Tradewinds park! If you’re planning an event, please contact the park directly for information regarding space and making reservations or visit their website. If you are going to need help determining which bounce house or inflatable you want to rent in Broward County contact one of our representatives to assist.